Chinese President Xi Jinping holds a welcome ceremony for his Zimbabwean counterpart Emmerson Mnangagwa. Chinese multinational group, Touchroad Holdings Group, is planning to develop a $7 billion tourism city in Zimbabwe as investor interest in Zimbabwe by international tourism players from the Asian economic giant grows. Touchroad Group chairman, Mr He Liehui, is expected in the country in June, leading a delegation of 17 billionaires from China expected to scout for investment opportunities and location of the tourism city. The birth of Touchroad Group can be traced back to May 17, 2000, when Mr He, the group's founder, travelled to Ghana to explore investment opportunities, making his first major investment in Africa. Touchroad International Holdings Group, has now become a multinational business with interest international trade, investment, cultural exchanges, tourism, industrial development of parks and construction of special economic zones. Touchroad conducts business interests in more than 20 African countries, as well as Europe and America. Zimbabwe Tourism Authority chief executive Dr Karikoga Kaseke, on Wednesday, said there had been massive interest from Chinese businesses in the local tourism sector and the Touchroad chairman was expected in the country to explore investment opportunities. "Following extensive discussions with Chinese investors, we were assured that Touchroad's chairman will be coming to Zimbabwe accompanied by a team of billionaires from China who want to scout for investment (opportunities). 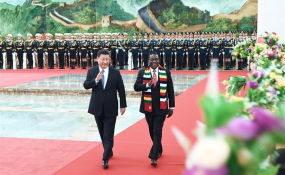 There was massive positive response from Chinese investors during the recent visit by President Mnangagwa. "The tourism city to be developed will require an investment of about $7 billion and the city will be bigger than the Harare CBD (Central Business District). The investors are determined to invest," said Dr Kaseke. He said the tourism city would be located outside Bulawayo or Harare, but Victoria Falls would not be part of the plan because of investment deals that have since been signed with investors already for the tourism resort. Dr Kaseke added that ZTA managed to secure agreements with some major Chinese tour operators to market the Zimbabwean tourism destination. He said the Chinese companies were not only interested in investing, but also pushing tourist movement towards Africa. "We are happy that we managed to talk to major Chinese tour operators and they promised us that with effect from next year they will be selling the Zimbabwe holiday destination," said Dr Kaseke. Touchroad is the first Chinese private enterprise to build a special economic zone in Africa -- the Touchroad Djibouti Special Economic Zone (TDSEZ). The zone is expected to be a fulcrum of China's Belt and Road Initiative in Africa. The tourism city concept is already working in South Africa's Sun City, a place which currently houses many of the country's tourism activities. ZimTrade acting chief executive Allan Majuru, said the response from Chinese investors was encouraging and that there was a need to build a brand marketable to the World. He said besides tourism, the country should take advantage of the Chinese market to export various products.